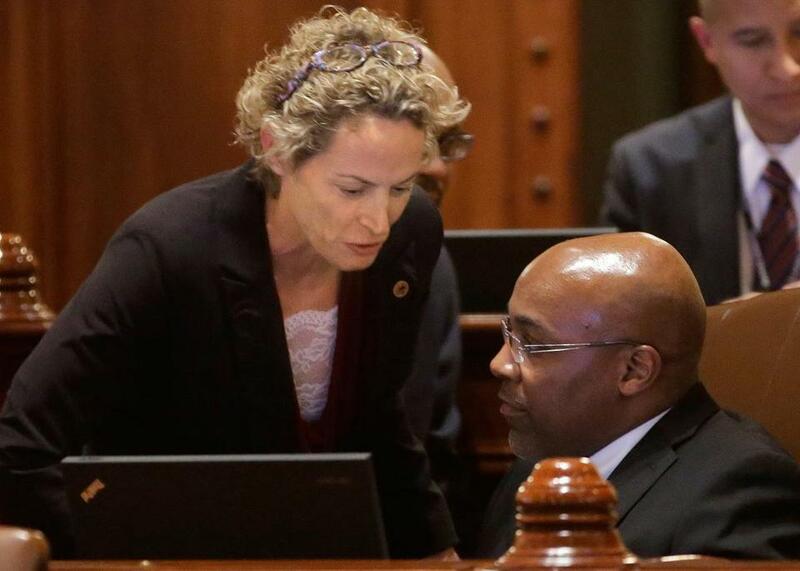 Representative Elaine Nekritz and Senator Kwame Raoul, both Illinois Democrats, after pension legislation passed. SPRINGFIELD, Ill. — The Illinois Legislature approved a historic plan Tuesday to eliminate the state’s $100 billion pension shortfall, a vote that proponents described as critical to repairing the state’s deeply troubled finances but that faces the immediate threat of a legal challenge from labor unions. The House voted 62 to 53 in favor of the plan, sending it to Governor Pat Quinn, who has said he will sign it. The Senate approved the measure 30 to 24 just minutes earlier. Public employee unions, which oppose the bill, vowed to quickly take legal action. They say the legislation is unfair to workers and retirees who for years made faithful contributions to retirement systems but now will see benefits cut because of government mismanagement. They also contend that parts of the measure are unconstitutional. Illinois’s unfunded pension problem is considered the worst in the nation, primarily because lawmakers failed for decades to make the state’s full payments to the funds. The massive unfunded liability has led the major credit rating agencies to downgrade Illinois’s rating to the lowest of any state in the nation. It has also siphoned money from education, road projects, and other areas. In addition to the labor unions, some Republicans said they opposed the bill because it did not cut benefits enough. Other opponents said there was not sufficient time for lawmakers and the public to review it.